There’s almost nothing better on a hot day than a frosty ice cream (or frozen yogurt) sundae that uses quality ingredients and just the right balance of toppings. You have to be careful not to overdo it with a blast of different flavors which can cause the sundae to become muddled and headed for the trash can. Content marketing programs often start strong with a great base, but the desire to create a quantity of content instead of focusing on the quality of ingredients can cause it to fall short. In 2011, Gartner predicted that by 2020, 85% of of customers will manage their relationships without even talking to a human. Content marketing plays one of the biggest roles in this trend. Good content marketing enables customers to self qualify themselves for your services and begin building a connection to you, before an email, phone call or in-person meeting ever takes place. 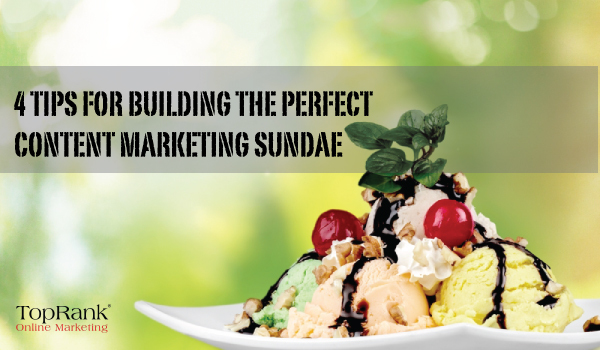 Let’s put your sundae making skills to test and discover why you scream, I scream we all scream for quality content marketing. What happens when you build the most delicious sundae ever and realize that the bowl, dish or vessel that you chose was flimsy or too small? Well, you have a giant mess on your hands. Diving headfirst into a content marketing program without the proper strategy in place can also have disastrous results. Chew on this; According to Content Marketing Institute 93% of B2B marketers are using content marketing but only 44% of them have a documented content strategy. Define your target audience: who they are, how they interact and what they care about. Identify what customer problems your content will help solve. Map target keywords to content topics to plan for following optimization best practices. Determine which stage of the buying cycle each piece of content supports. Decide which content marketing success metrics are most meaningful for your business. Even a plain vanilla ice cream can be spiced up with a little chilli powder, salt or caramel. In the same vein, content topics that may seem mundane can be spiced up by adding the use of metaphors, storytelling and situations that your customers can relate to. While the topics above may not be directly promoting the benefits of using recruiting software in the headline, they are topics that your potential customers may be searching for when looking to hire new candidates or manage existing employees. If you’ve ever mixed the wrong flavored syrup with your ice cream and toppings raspberry ice cream can lead to time wasted and desserts thrown out. Take the same care when selecting a team to lead your content marketing efforts. Keep in mind that your content strategists, writers and all other team members involved will be setting the tone and representing the voice of your organization. It’s important to make sure that these teams are the perfect fit for the way that you want to communicate with customers. Properly vet each team member whether you’re utilizing internal resources or a content marketing agency. The options for sundae toppings are immense, as are the different content tactics you can create and the way that they are promoted. Flavor your content marketing program with a variety of content types to keep your audience engaged and entertained. Before investing in expensive tactics like video or custom illustrations, speak with current customers to determine what types of content they like to consume. Social messages that you create to promote your content should be engaging, concise and customized for the audience. Remember that the length and message of a Facebook message is going to differ from the way that you will promote on a platform like Twitter. If you aren’t servicing your clients with great content, you can bet that at least one of your competitors will. Some of you may be hesitating because you don’t know where to start. Consider reaching out to any of your existing digital marketing connections or contact an agency like TopRank Marketing to see what options are available. If you’ve been creating content for some time but are not experiencing success, make sure that you’ve included all of the elements above to your content marketing sundae. What do you believe is the hardest part about creating a content marketing program that connects you with the right prospects for your business? It’s all about quality content creation. Fantastic article Ashley! Love it. Wish people understood more the power that can be in the content they create. So many folks seem to be stuck curation mode. Thanks Julia! I’m glad you found value in the article. Great article Ashley. I loved your comparison with dessert. I wrote an article on connecting social media with cooking before too 🙂 I find that making these type of analogies to be easier and a fun way to understand. Don’t forget to rate your dessert with data and analytics to understand if you made the ice cream for the correct audience.